260th day of the year. There were then 105 days left in 2018. 89th day of Summer. There were 5 days left till Fall. 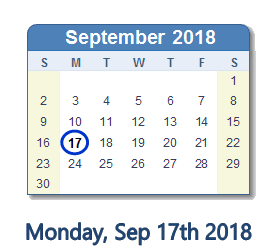 What happened on September 17th 2018? We applaud the President’s decision to declassify portions of the Page FISA application and communications from the key people at the FBI and DOJ who ran the Russia investigation: Comey, McCabe, Strzok, Page, and Ohr. Transparency is a good thing.